To continue our series of Awesome Games That Time Forgot, I want to draw your attention to a PC game, released in 2003. The Commandos series has been around for some time now, with the last iteration having been released only a few years ago, however, it is the third game in this strategy franchise that you should now draw your attention to. Imagine a game so difficult, you could throw away your keyboard in frustration. Luckily, Commandos 3 is not like that game. What Destination Berlin is though, is an extremely difficult real-time strategy game. But somehow, it manages to be engrossing and engaging no matter how many times you fail. Think Demon’s Souls in World War Two. Without the dragons. Or knights. And with explosives. 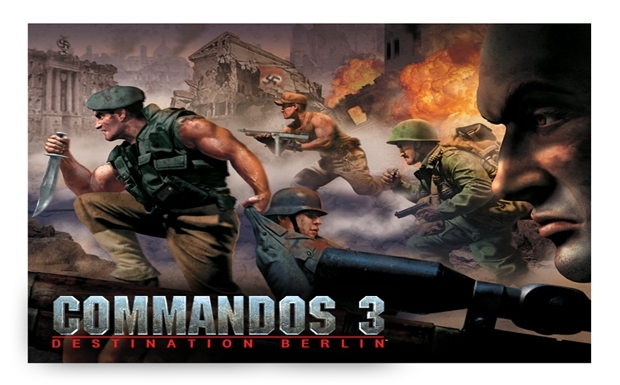 What made Commandos 3 such a great game is that there was always a different way of accomplishing your objectives. One level places you and some of your agents in a gigantic scenario- Berlin- complete with complete underground sewers, several-storey high buildings and the massive, urban sprawl itself. How do you want to eliminate that SS official? Snipe him from afar? Place explosives on his car? Disguise yourself as Gestapo and poison him? The choice is very much yours. The game is all about variety- while one of two missions might have you with just one, specialized, agent at your disposal, most of them give you two or three, each with their own unique abilities, as well as a few bog standard soldiers to command as cannon fodder.